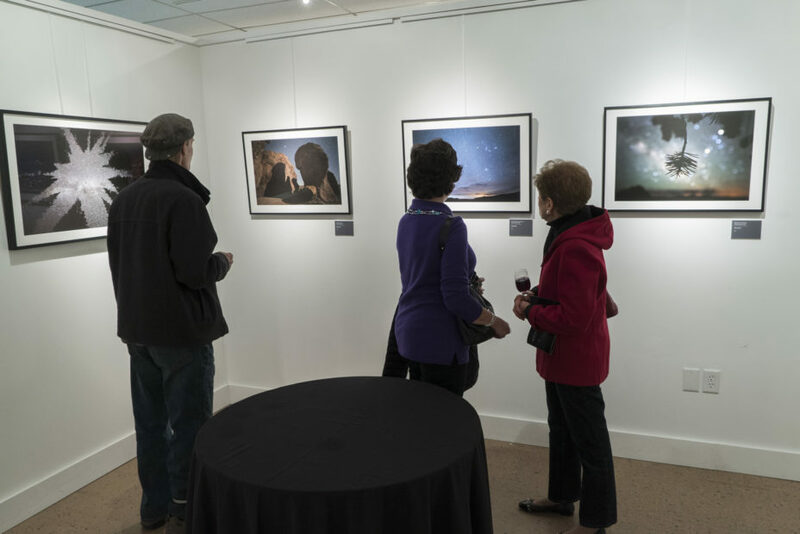 Thanks to everyone at the SHAPE Gallery in Shippensburg, PA and Ann for a successful reception on April 6. Just getting around to posting photos of the evening. 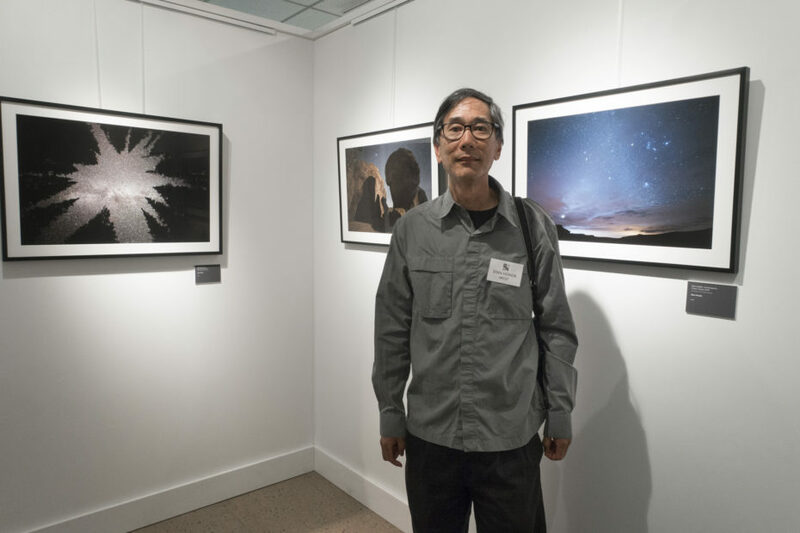 The exhibit looked great, it was hung nicely with really good lighting, thanks to Kurt. 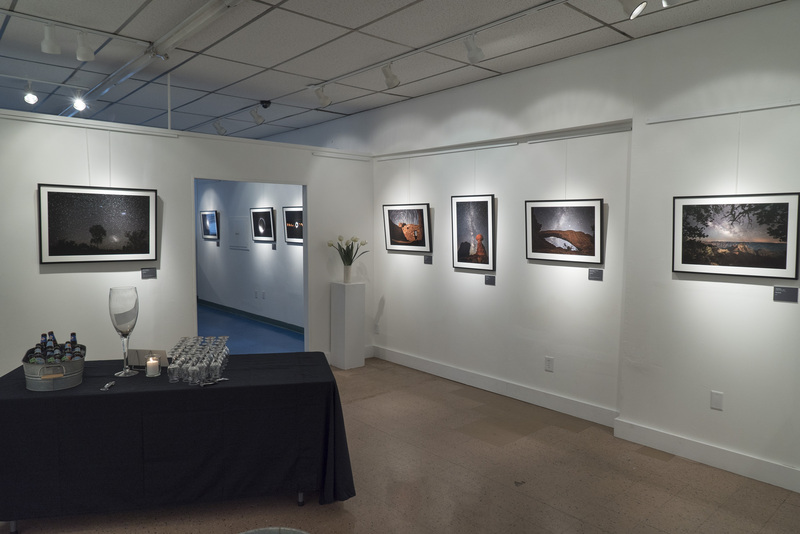 All at the gallery worked hard to put on this show, glad we were able to make it happen. There were 30 pictures in all, most of them the night sky photos and four space shuttle images, by request of the gallery. I think five sold, the rest are still available. 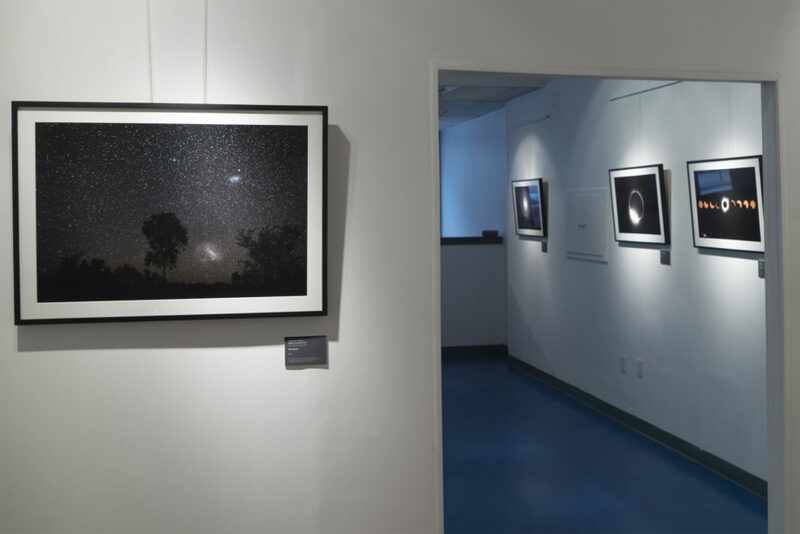 If you are ever in central Pennsylvania, check the gallery out. Ann took a photo of me in the interior room. Interior room and main gallery. Thanks to everyone that came to the reception. 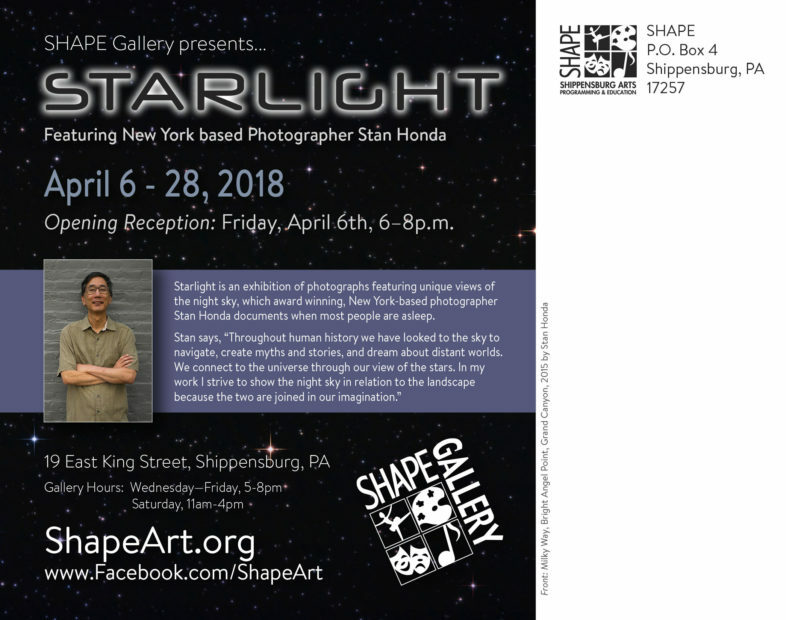 Announcing a show of the night sky work at SHAPE Gallery in Shippensburg, PA. 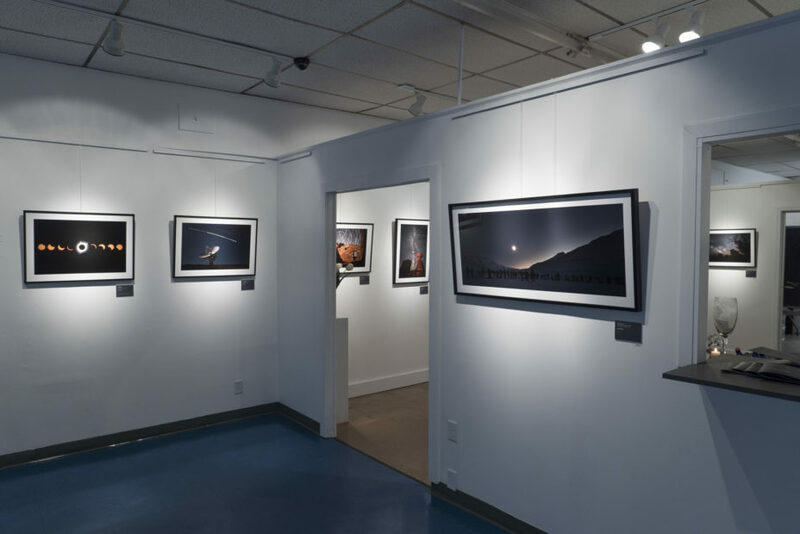 Thanks to Joshua, Kurt and Mark at the gallery for helping put the exhibit together at this very nice community gallery. 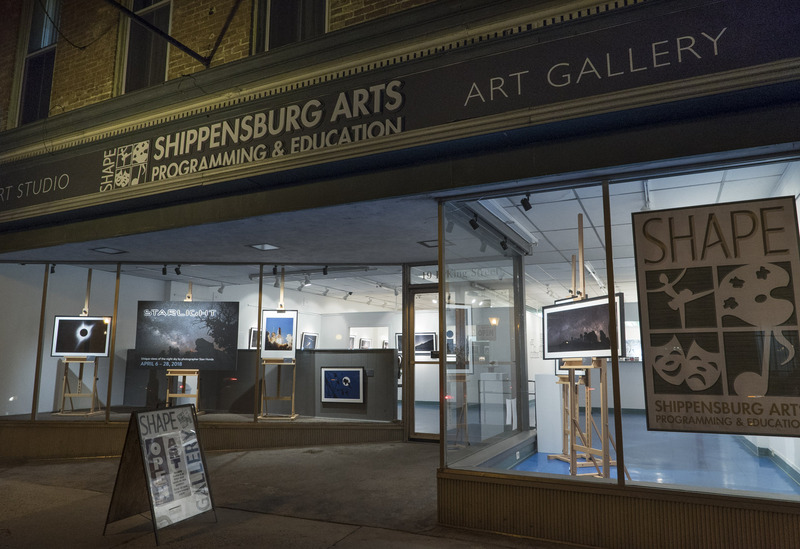 We had a small show at SHAPE last April of work from students at Shippensburg University who took the Digital Photography Exploration class I taught for one semester. The final project photos looked great in the gallery. 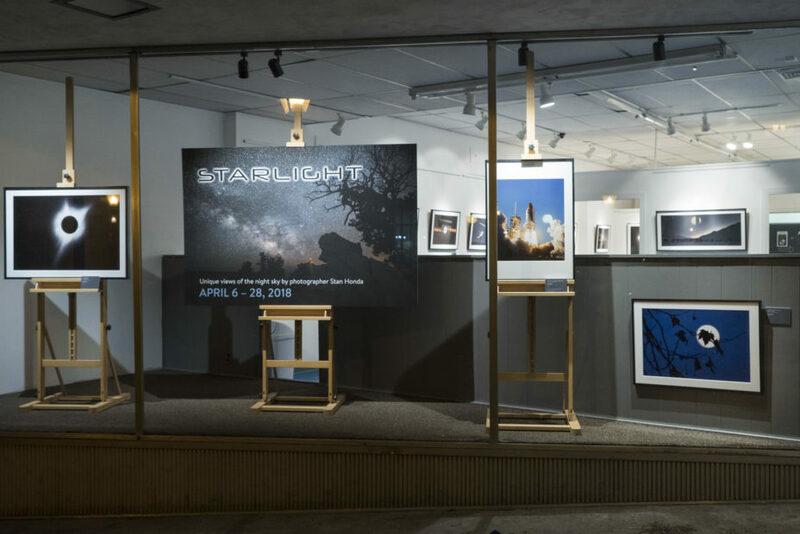 The opening reception for the Starlight show is Friday, April 6 and the show runs through April 28. New corona: 8 different exposures combined for a detailed look. 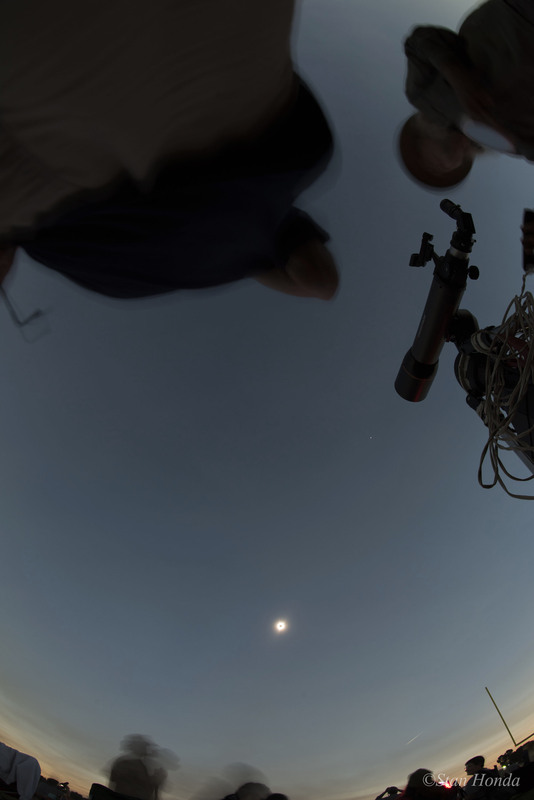 The star Regulus is seen at lower left. Our trip is continuing! 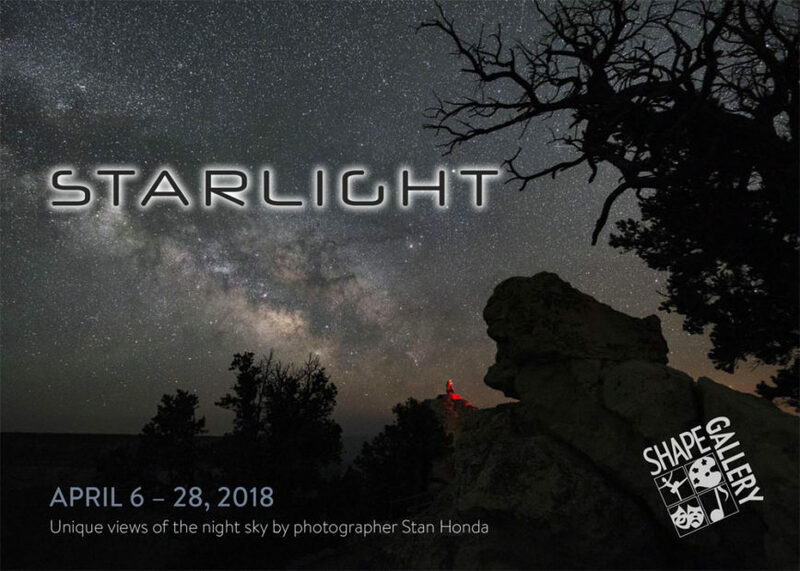 We’ve been at Rocky Mountain National Park the last few days, Stan has been teaching a night sky workshop with the Rocky Mountain Conservancy. First off, I went back through my eclipse photos and found the series that was shot at varying exposures, in order to get the detail in the sun’s corona. Since it is bright near the sun’s disk and fainter farther away, short to long exposures are needed to show the wide range of brightness. 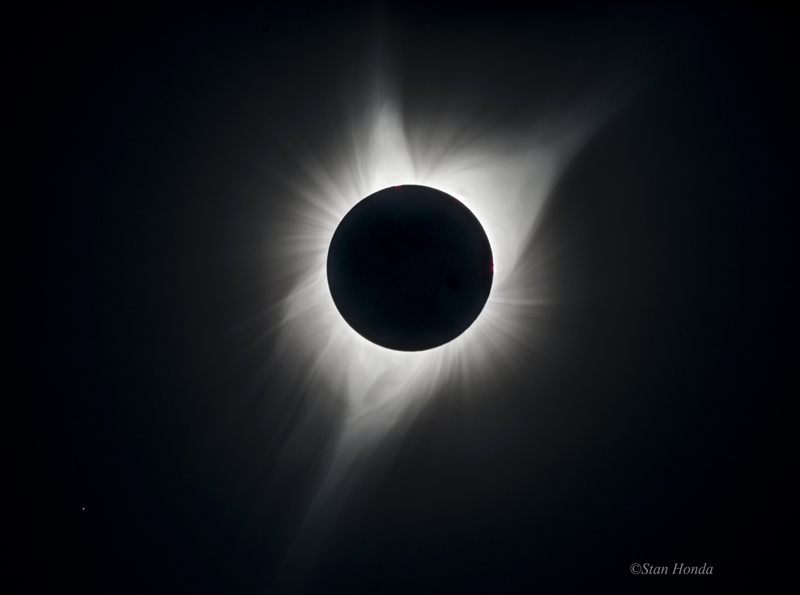 I combined them together to get this amazingly detailed view of the corona during totality. It still doesn’t match what we saw with our own eyes up in the sky above Madras. The night sky photography class went really well. Eight people signed up for the three-.ay workshop. We spent two nights in the park under the spectacular sky here. I shot some photos of the class at work on Saturday night. Here we are at the alpine Tundra Communities section, at an altitude of 12,000 feet. A crescent moon lights up the landscape and people, the glow of Denver can be seen in the lower right part of the photo. 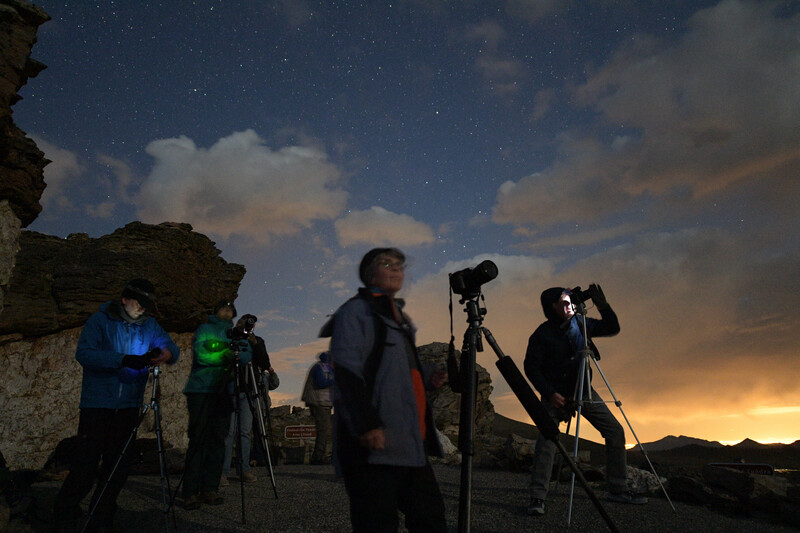 The Night Sky Landscapes photography class at 12,000 feet in Rocky Mountain National Park. 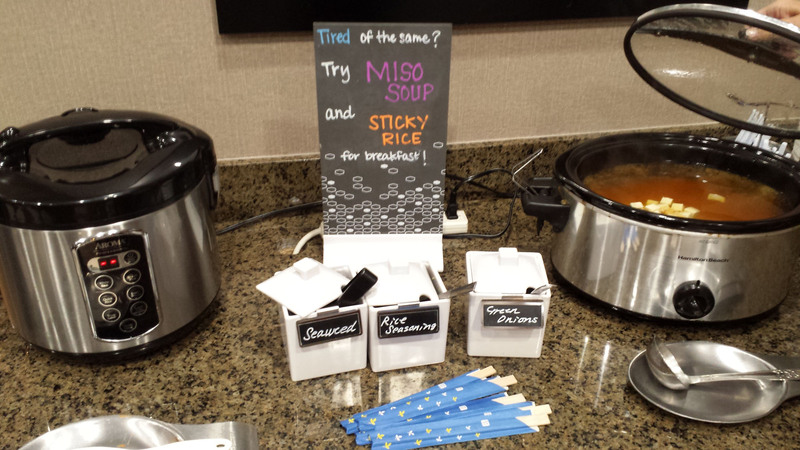 One more shot from Boise: at the Hampton Inn breakfast we saw this display of miso soup and sticky rice! In Boise! And it was good. 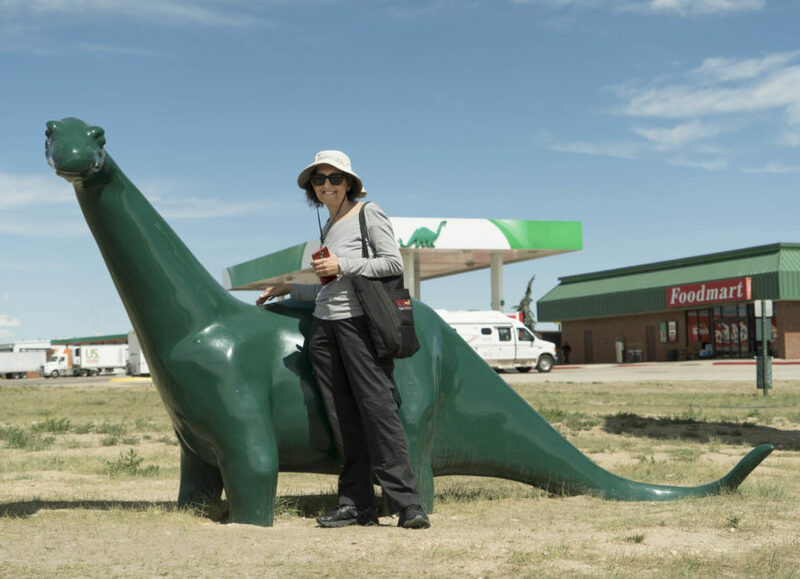 Farther down the road near Laramie, WY, Ann poses with the Sinclair dinosaur at a rest stop. We ‘discovered’ the Sinclair gas stations, which you don’t see back east. We liked the idea of the dinosaur logo. Miso soup for breakfast! In Boise! Ann and the Sinclair dinosaur. 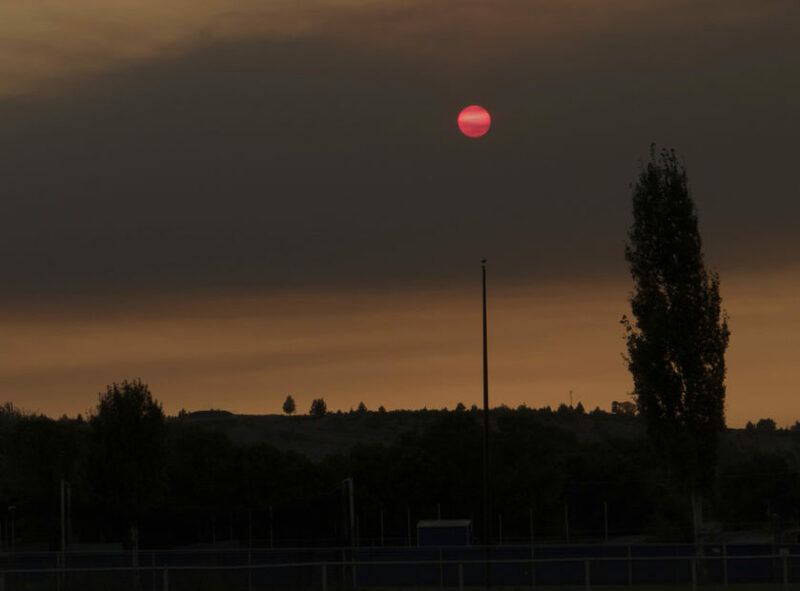 Smoke from a fire makes a red sun on Monday evening in Madras. As we packed up most of the campsite Monday evening, an incredible red sun hung low in the west, smoke from a nearby fire creating a filter for the light. Quite an all-day show for our sun. While the eclipse watching is over, the viewing of eclipse commerce continues. 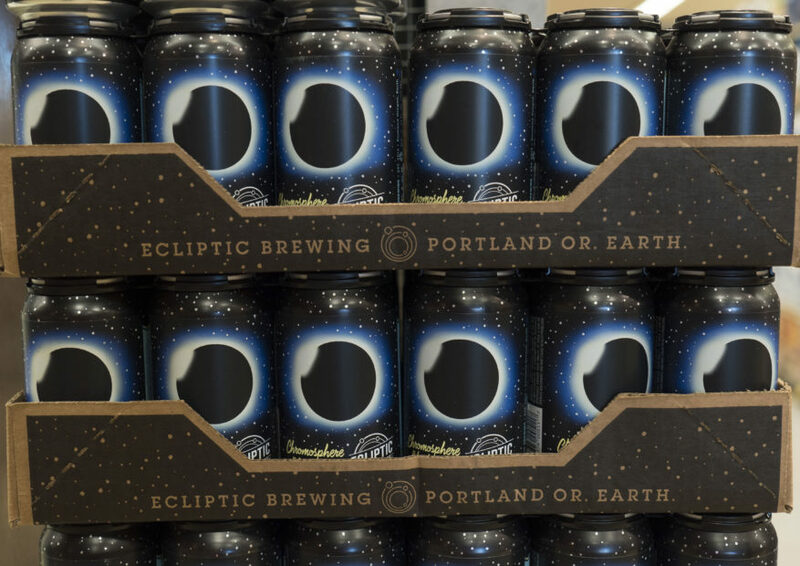 On our road trip to Colorado, we spotted an eclipse-themed beer display: “No Light? (with a picture of an eclipsed sun)– Bud Light” ($24.49/24 pack/16 oz. cans). 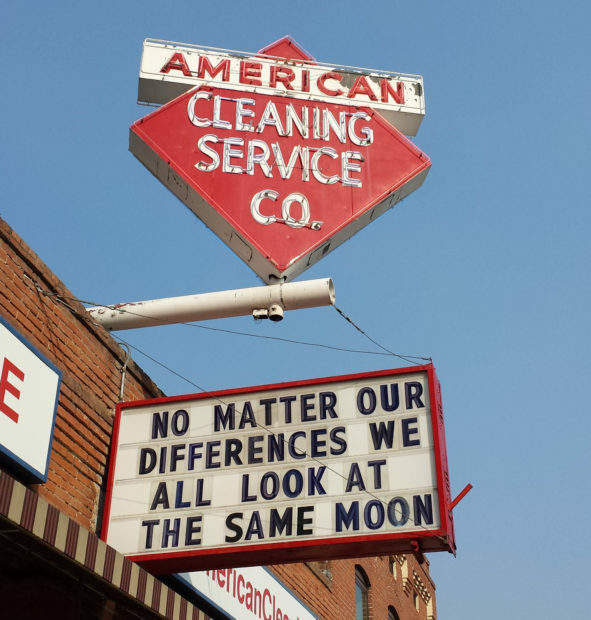 Walking to dinner in Boise on Tuesday night we saw an amazing revolving neon sign for the American Cleaning Service Co. Below was a marquee that said, “No matter our differences, we all look at the same moon”. Many people we have met when we stop for our picnic lunches at local parks or rest stops traveled to the path of totality and are now returning home. The eclipse really did seem like a big communal experience. Also on our Boise walk we found Rediscovered Bookshop, quite a good bookstore which we returned to after dinner. 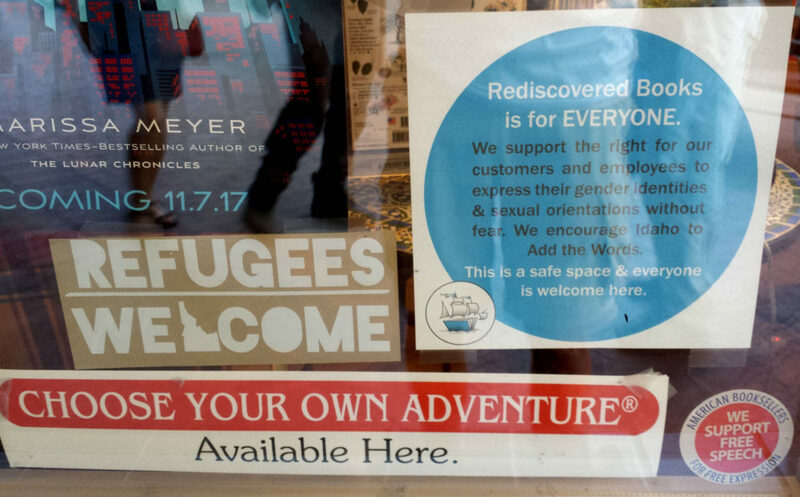 In the window were various small signs welcoming refugees and agitating for expressing one’s gender identity. It adds, “We encourage Idaho to Add the Words”. Ann looked up the phrase and it is an LGBT group and PAC that since 2010 has advocated adding the words “sexual orientation” and “gender identity” to Idaho’s human rights act. The American Cleaning Service Co. in Boise. Window of the Rediscovered Bookshop in Boise. 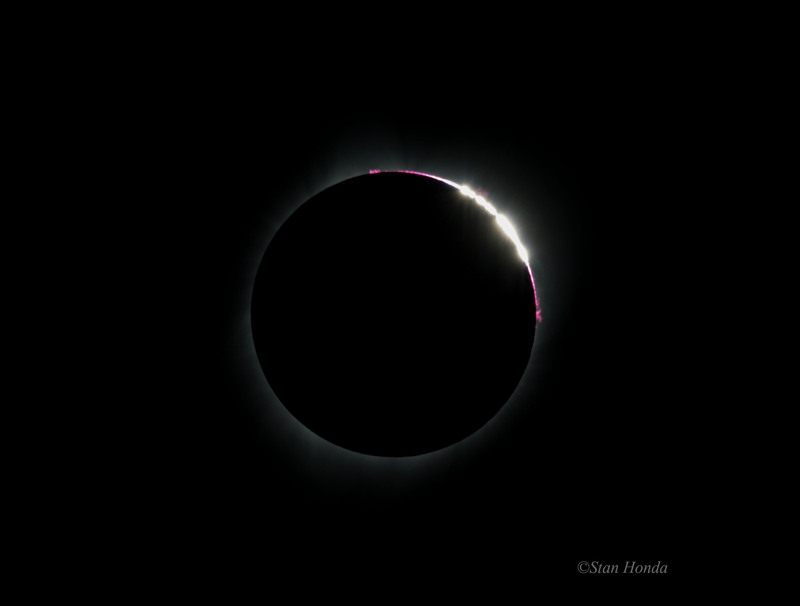 The ‘diamond ring’ effect, just before totality. I found a nicer ‘diamond ring’ effect photo I’ll post here. It’s when the moon is just about to cover the face of the sun and the bright light shines on one spot of the disk. This one is more dramatic than the previous photo. Some random observations from eclipse day and after: Rich Krueger, the Flagstaff teacher leading chants of “Go moon, Go!! Eat that sun!! !” as the eclipse was in its early stages. 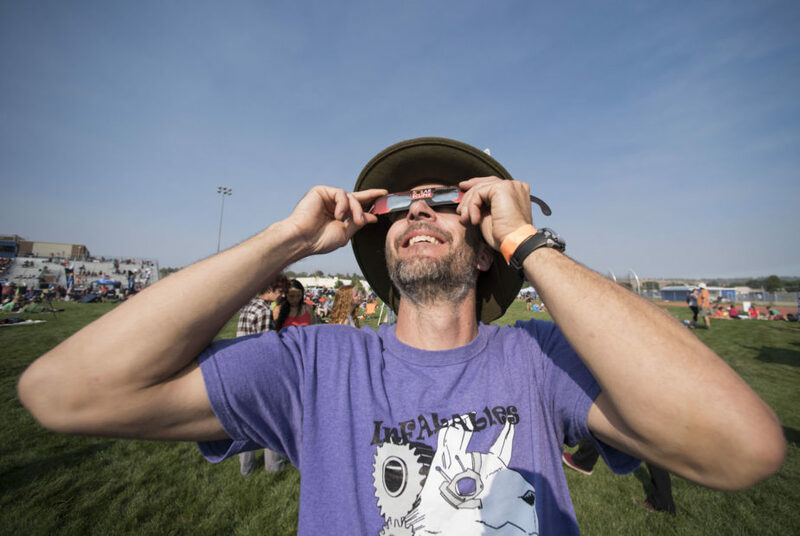 A headline in the Argus Observer, the newspaper for southeast Oregon and southwest Idaho: “Man describes viewing eclipse as ‘caveman like’.” Hard to make any of this up. About five minutes before totality the light was a very eerie orange and dim, unlike any I’ve seen. I took a photo of Steve Kaltenhauser of Calgary, Canada, and the rest of the crowd in the stadium under this odd light. Ann and I are on a three-day road trip to Colorado and have seen lots of interesting sights from Oregon, Idaho and now Wyoming. Lots of the country that we haven’t seen before and great landscapes. We’ll post more updates. Rich Krueger watches the partial phase. Steve Kaltenhauser of Calgary, Canada in the eerie orange light five minutes before totality. We’re a day late, but here’s the eclipse. I was working for Agence France-Presse and sending to Space.com and a couple of other astronomy websites that I didn’t have time to post to the blog. It was quite a sight, incredibly surreal to see a black dot where the sun should be. The corona extended far from the sun as seen with the naked eye. It did seem very different from the Svalbard eclipse in 2015. The corona looked like some creature surrounding the sun that came out just during the eclipse. I can see why ancient people might have been terrified of the sight. The temperature dropped 20 degrees F in Madras, as measured by some scientists who were taking readings of all sorts of things. There were cheers and gasps from the crowd gathered at Madras High School as totality began. Darkness descended on the town as the eclipse proceeded above us. The football scoreboard clock counted down the seconds to the end of totality. I was operating 4 cameras and changing the controls on 2 of them but managed to take my own advice and watch the eclipse for many long seconds. Here’s a selection of photos and I’ll post a bigger page in a few days. Now Ann writes her impressions: As it got closer to totality, the temperature dropped 20 degrees from 77 to 57. About 10 or so minutes from totality, the sky was washed in darkness but it was a kind of bright darkness, not like anything I’ve ever seen. You look and you think, it’s dark. But it’s not. It’s like looking through sheer navy blue or black fabric in daylight. 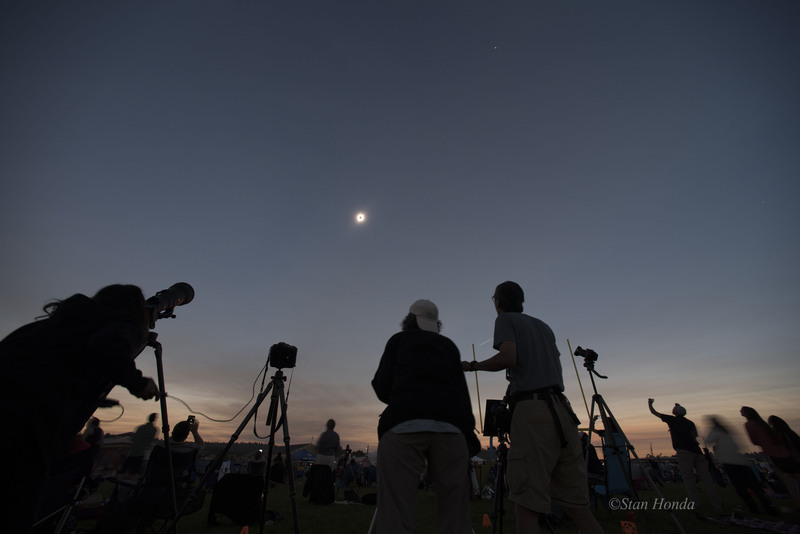 Then, at totality, it was twilight, very chilly. All eyes were on the sun. People were spread out over the football field, cheering and clapping. There was a brilliant, diamond white light around the sun, glowing with a terrifying intensity. People were staring wondrously, like a spaceship was landing, Richard Dreyfuss in Close Encounters of the Third Kind. It was dazzling white light, the whitest of whites, like a Broadway musical, showgirls in rhinestones, a thousand klieg lights going off all at the same time. It brought tears to my eyes. On the field at Madras High School. The “Bailey’s Beads” effect is seen and red solar prominences. The bright sunlight shining through the moon’s mountains and craters create the bead effect. My friends Wally and Rush from Albuquerque during totality. The entire eclipse path from the Madras High School football field. The scoreboard counts down to the end of totality. The students cooking their dinner. 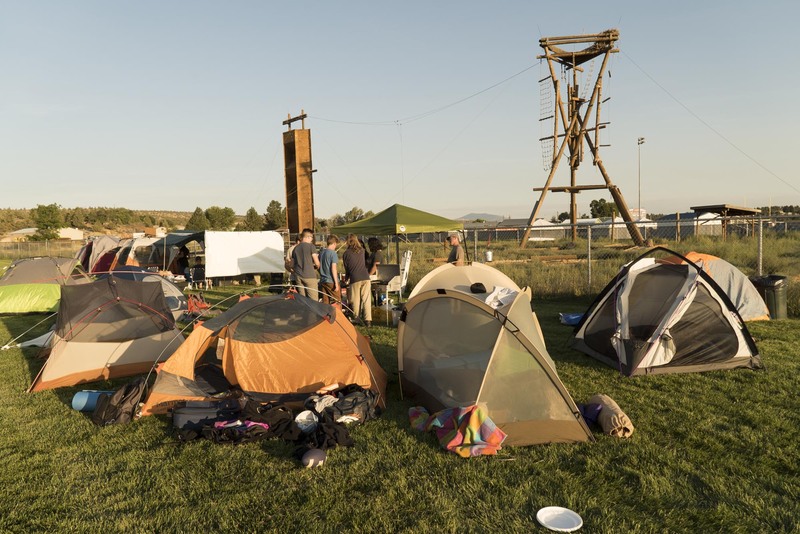 Here’s our campsite at the Madras high school. We are here with the Flagstaff Arts and Leadership Academy (FALA), a great group of high school students led by Rich Krueger, the astronomy and physics teacher. We circled our tents and have a nice space, with a few canopies making shade. 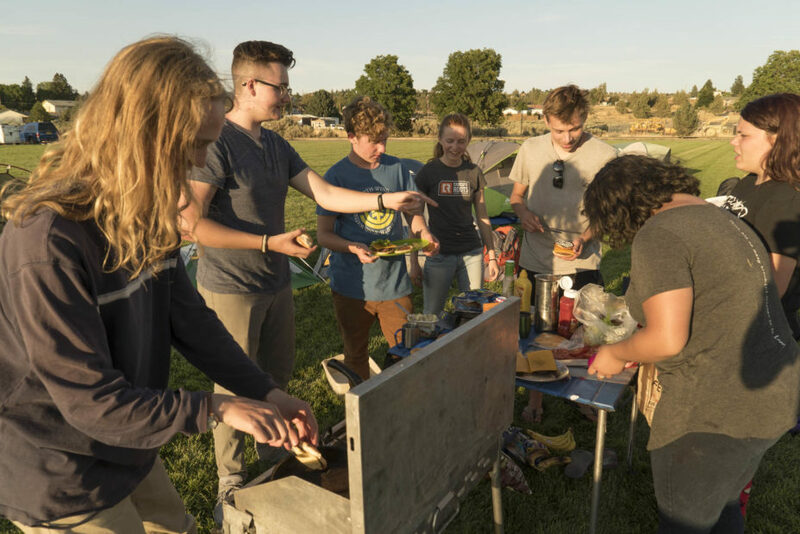 The students are in charge of the cooking, so they gather at meal times and prepare the food. Our group of seven includes my friend Rush and his brother, Wally, who brought the usual truckload of camping and cooking supplies. Today Aubrey, myself and Peter, a San Francisco photographer, went out to test our equipment on the football field. I was having problems with some remote triggers but will figure out a solution. James, one of the students, is assisting me and that’s a big help. We saw high clouds come in off and on during the day so that’s a worry although people are pretty confident the sky will be clear tomorrow. The star party is this evening, and it’s an early morning tomorrow. 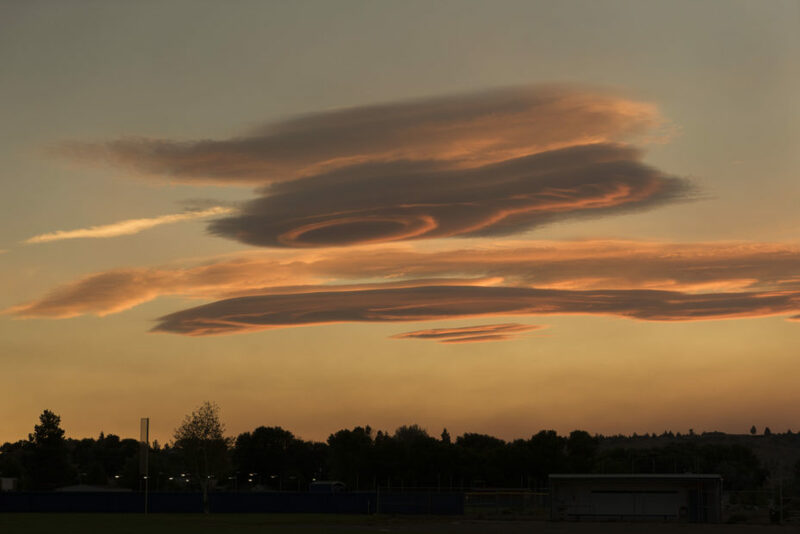 UFO cloud on western horizon in Madras. We’re at two days and counting to totality. We’ve moved from our comfortable hotel to camping on a baseball field at Madras High School. It’s not too bad. We’re on grass fields, away from the throngs of campers on big dusty fields around the town. Since we are with a Flagstaff group helping Lowell Observatory with the eclipse event, they let us pitch a tent. Last evening after setting up the tents, we saw an amazing display of clouds at sunset, including one shaped like a UFO. We noticed an increase in traffic as people head into the area. Predictions say 100,000 people will invade Central Oregon by Monday. 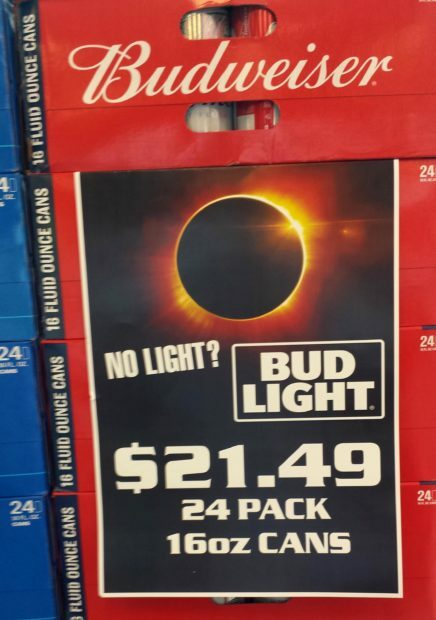 Official beer of the eclipse. 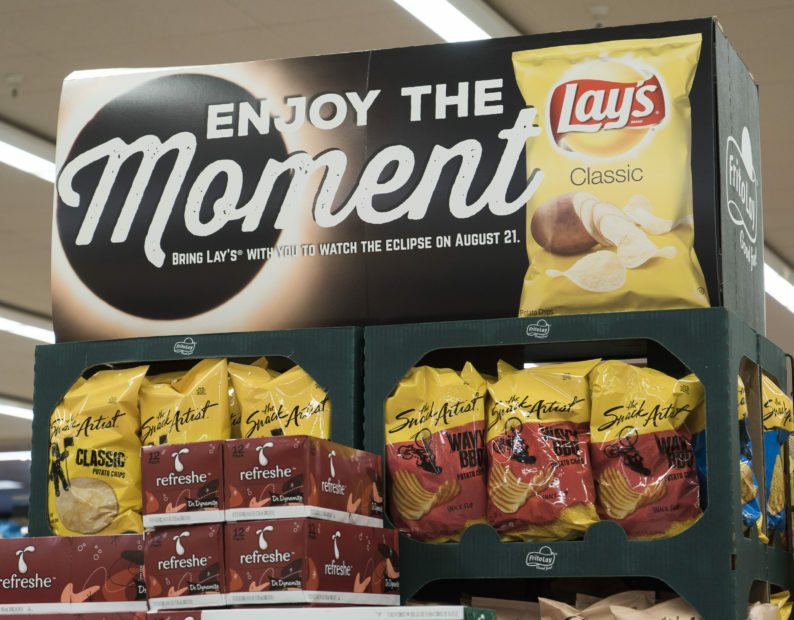 Official potato chip of the eclipse. 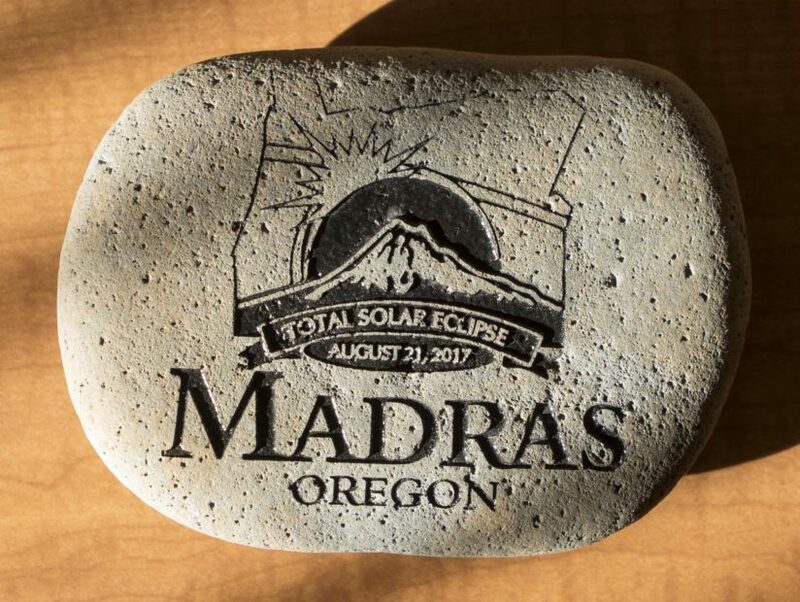 For those wondering where Ann and I are viewing the eclipse, we have arrived in Madras, Oregon, apparently the center of the total eclipse universe for Central Oregon. We’ll be helping out at the Lowell Observatory Eclipse Experience at the high school over the weekend. First we needed to obtain the essentials, such as a hat, nicely designed postcards and the eclipse rock—all purchased at the Black Bear Diner. Two T-shirts completed our set of souvenirs, those purchased at Antlered Teepee Espresso. (See photos below.) Various estimates say 100,000 people will descend on this area. Madras is a town of just over 6,000, mostly agriculture. 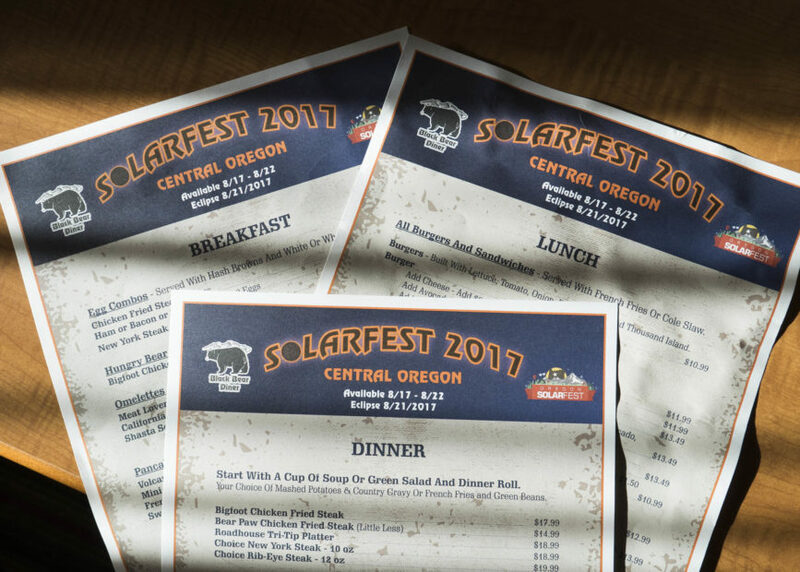 The diner had very nice eclipse-themed menus, and the waitress gave us copies for breakfast, lunch and dinner. We saw lots of signs welcoming eclipse watchers on street lights and storefronts. Black Bear Diner menus, collect them all. Official Eclipse Rock, a must-have. 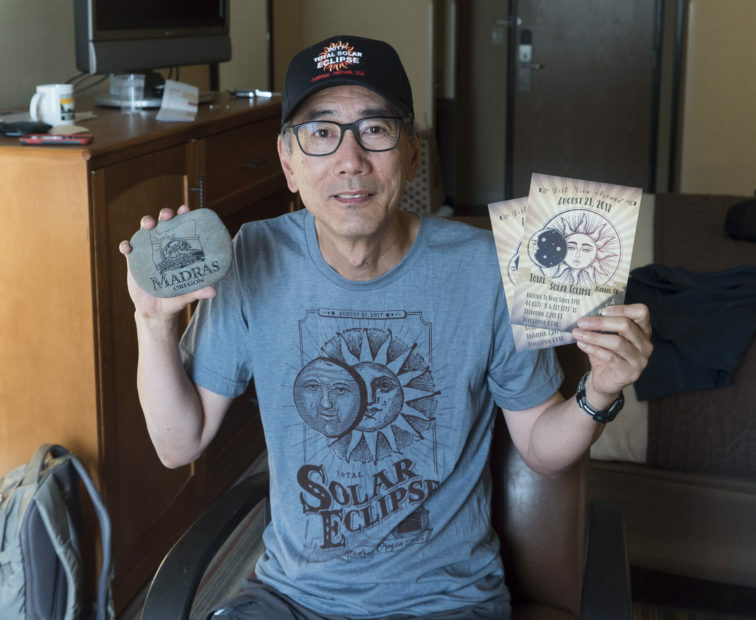 Stan is set for the total eclipse with hat, T-shirt, postcards and Official Rock. Photography tips and links for the upcoming total solar eclipse on Aug. 21, 2017. 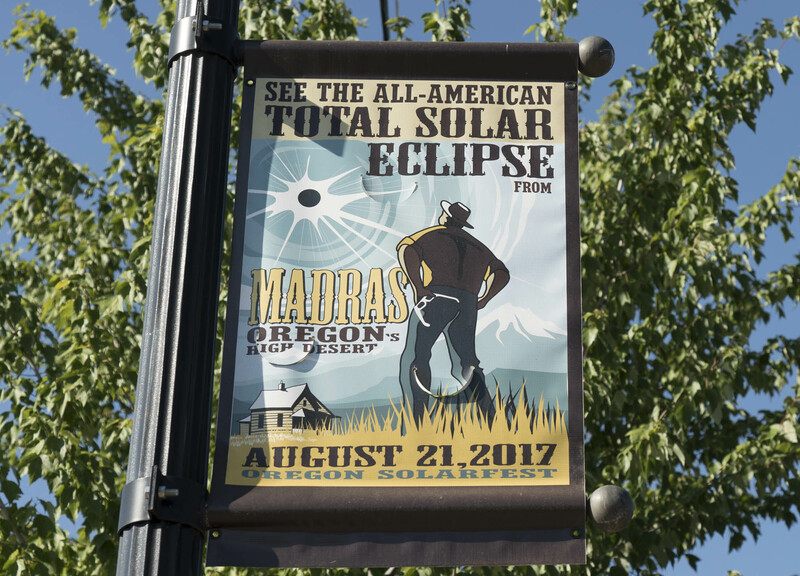 Follow the blog as Ann and I travel to Madras, Oregon to view the eclipse. Totality in the Arctic: March 20, 2015, Svalbard. Vernal equinox total solar eclipse. 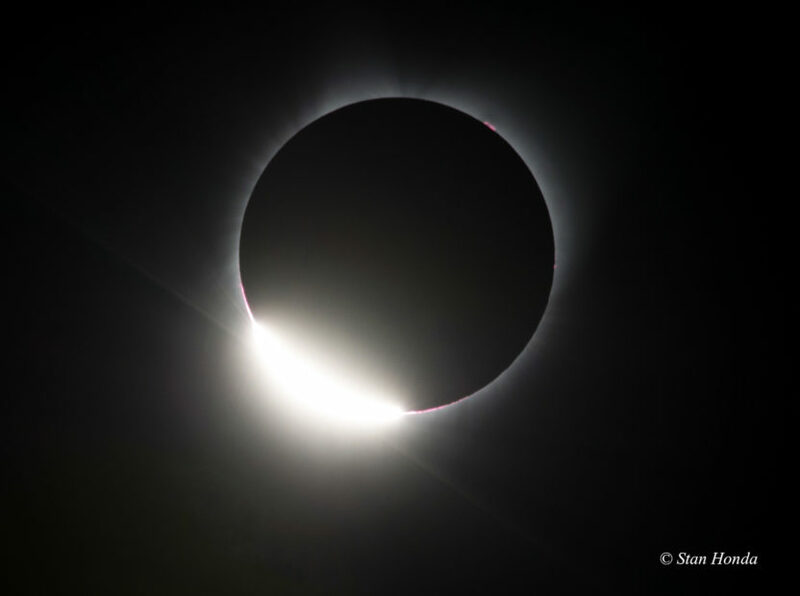 NationalGeographic.com interviews me and astrophotographer Babek Tafreshi on How to Photograph a Solar Eclipse. First advice is to take time to look at the eclipse with your eyes. It will be the most surreal and fantastic thing you will ever see. And if you are messing around with the cameras too much, you will kill yourself if you didn’t see much of the totality. Remember to look up and experience it, you won’t regret it. (It is perfectly safe to look during totality without the filters or glasses, you aren’t looking at the surface of the sun, just the outer atmosphere (corona) which is about as bright as the full moon). The total part of the eclipse only lasts between 2 and 2 ½ minutes, so it is quick. On the NASA map in the link at the top of this page, you can zoom in to your location. Between the blues lines you will see a total eclipse. Get as close to the center red line as you can to see the maximum in that area. Outside of the blue lines you see a partial eclipse, so you want to avoid that. Zoom in and click on a town, a box comes up with all the times. It’s in Universal Time, or GMT so you convert to your time zone. Main thing to pay attention to is “Start of total eclipse”. On the center path, I’m pretty sure all hotels are taken. Best to get to your location early Sunday at the latest, early Saturday if you can. There will be huge crowds and many states are predicting gridlock on highways and especially side roads. If you can camp, that should work or even sleep in your car- which I think lots of people will be doing. If you have friends or relatives near the center line, stay with them. If you can stay inside the blue lines, you’re good in case of heavy traffic Monday. Get up real early Monday (before dawn) if you are driving anywhere. 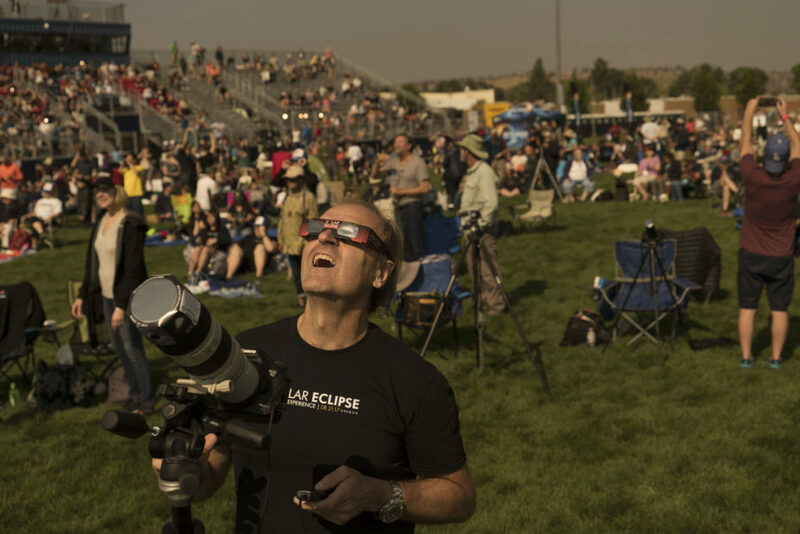 There are mainly two kinds of eclipse photos- wide and telephoto. The telephoto is the tight shot you see all the time, for the most part every eclipse looks the same shot this way. The wide shot is more interesting since you see details of your surroundings. If you have only the one lens that came with the camera, then use that on the widest focal length setting. The sun will be high in the sky- the box on the NASA Google map also has the altitude (ALT) in degrees. So you can shoot real wide horizontally, or less wide vertically. You can do a test by seeing what lens focal length you need to also get the ground in the shot. Go out just before noon or around 2pm and see if the sun and the landscape fit into your viewfinder. Unfortunately the wider you go, the smaller the sun gets. But the sight in the sky is so spectacular, it won’t really matter. Plus if you don’t get the landscape, that’s ok, you’ll probably get some trees or people in the photo. Don’t try to changes lenses during the totality!! There isn’t enough time and you will miss quite a bit of the eclipse. Just stick with one lens and take in the whole experience. Exposure can be tricky. 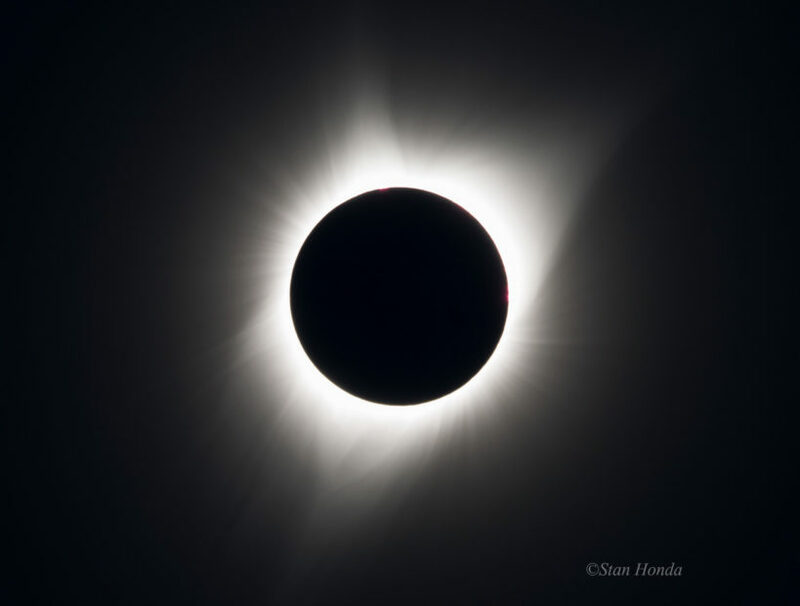 I did one total eclipse, in March 2015 in Svalbard, which is north of Norway, way above the Arctic Circle. Very wild. I shot the whole eclipse, from start to finish. That includes the partial phase which lasts about 1 hour on each side of totality. 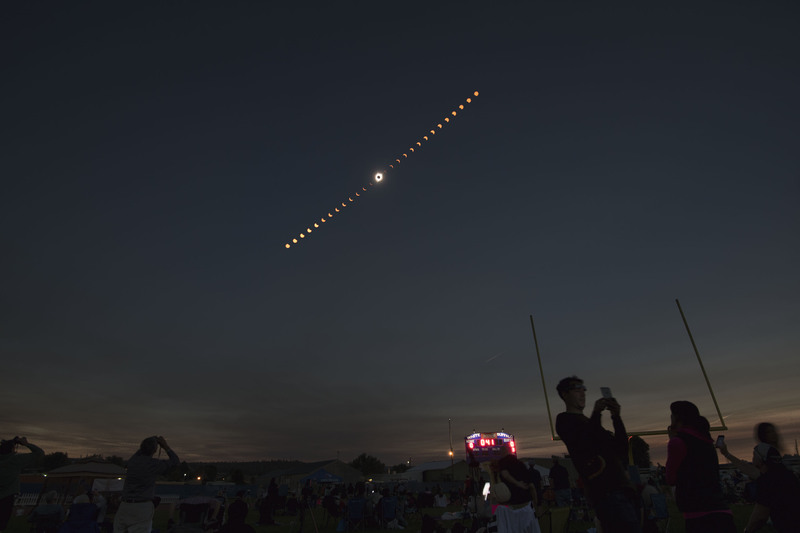 I used safe solar filters on a telephoto and wide angle and later did a time-lapse sequence still image of the whole thing. You definitely need the solar filter if you are planning to shoot before and after totality. With the sheets I recommended, you can cut them to the diameter of your lens and use tape to hold it in place. Make sure you can remove it quickly, you’ll have to do that right at totality. You might want to concentrate on just the totality. Then you can get shots of the people around you before and after and enjoy the partial phases of the eclipse with the solar glasses. If you want just the totality, put the camera on the Manual mode a few minutes before (people will tell you when it is getting close), set the camera at ISO 400, f8, 1/500 second. Take a couple at that setting (you don’t need a filter for totality). Then slow down the shutter speeds to 1/125, 1/60, 1/30 and 1/15 sec. You should have the camera on a tripod. Then you can go as slow as 1/8 sec. Take a couple at each setting. It will get very dark, you may have to turn on the light in the camera to see the settings. Try all of this at night to see if you can see everything. But also make sure to look up at the eclipse when it happens! Most of all, have fun and enjoy the experience.